I guess a lot of people know about my obsession w/ Caesars (not that I was keeping it a secret or anything) 'cause the kind folks at Matt & Steve's (Twitter: @theextremebean, Facebook: The Extreme Bean) sent me these awesome goodies the other day :) Thanks guys! Matt Larochelle and Steve McVicker, co-founders of The Extreme Bean, developed their spicy pickled bean from a small rented apartment over 10 years ago. Met during their bartending days, Matt and Steve both wanted better garnishes for the Caesar cocktail (aside from the plain ol' celery stick) and they finally settled for the spicy pickled bean. Instead of using a typical green bean from a local grocer, Matt and Steve found a unique bean that grows longer, sweeter and crunchier - the Kentucky flat bean. Using “how to pickle” instructions from Matt’s mom, the duo began experimenting with spice combinations and soon after, The Extreme Bean was born. Available in Spicy and Garlic Dill flavours, The Extreme Bean is sold at various retail locations across Canada and at Matt and Steve's online store. Check out Matt and Steve's latest variation on the bean: the B'nOlive: a giant olive stuffed with the Extreme Bean. Whhhhaaaaaat!?!? Amazing. Aside from the very important garnish, a great Caesar also needs a good tasty rim. In comes Matt and Steve's Caesar Rimmer that packs just the right amount of spice and bite. Hey and what do you know? 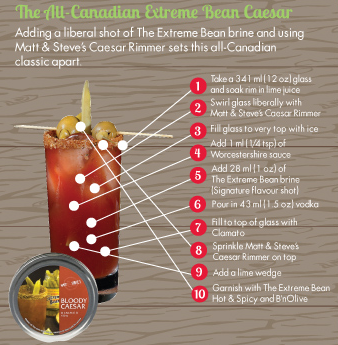 It's the long weekend coming up and if you're thinking of entertaining guests, having a BBQ, or perhaps going up to the cottage for some nice patio time, stock up on these Extreme Bean products 'cause seriously, any ordinary Caesar will become one kickass Caesar when topped with an Extreme Bean, a B'nOlive and a thick, spicy rim. Your friends and family will LOVE you. YOU will love YOU. Even if you are not a fan of the Caesar cocktail (and kudos to you for reading this far) these Extreme Bean products also make great accompaniments to any salad, charcuterie board, or even just to nibble on as a snack (okay maybe not the Caesar rimmer..well you can if you want...but it's a little weird).